An api monitor tool which can automatic tracing all apis input and output parameters. this application will auto trace the target program and monitor the input and output of function call. Unlike others apispy or api monitor tools, the software did not need to develop any dll or hook dll. Using VBScript or JScript to control Auto Debug (New in V5.0). Supporting tracing COM and activex Interface. Supporting spying the parameters of function before and after the function is called. Supporting the function that the target program will dump CallStack when exception occurs. Supporting Plug-in technology. The user can custome input format and output format. All the API functions, including the opened functions that are called inside the DLL, can be monitored in deed. 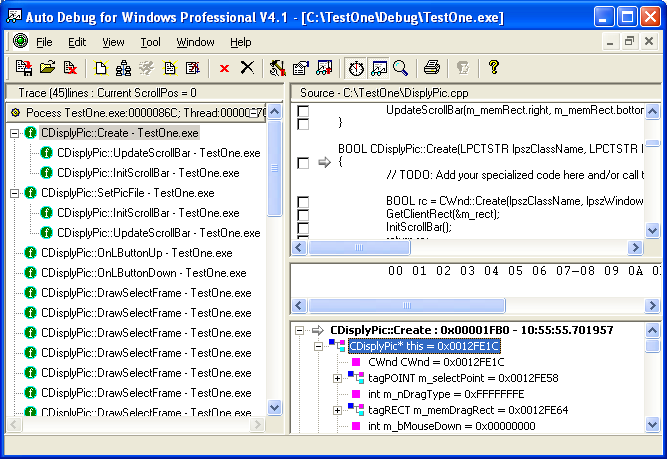 Qweas is providing links to Auto Debug Professional 5.1 as a courtesy, and makes no representations regarding Auto Debug Professional or any other applications or any information related thereto. Any questions, complaints or claims regarding this application Auto Debug Professional 5.1 must be directed to the appropriate software vendor. You may click the publisher link of Auto Debug Professional on the top of this page to get more details about the vendor.